A well-constructed garden defines the crux of an intricate design masterpiece, and without an inventive, keen and skilled construction team, there won't be a great project to talk about. 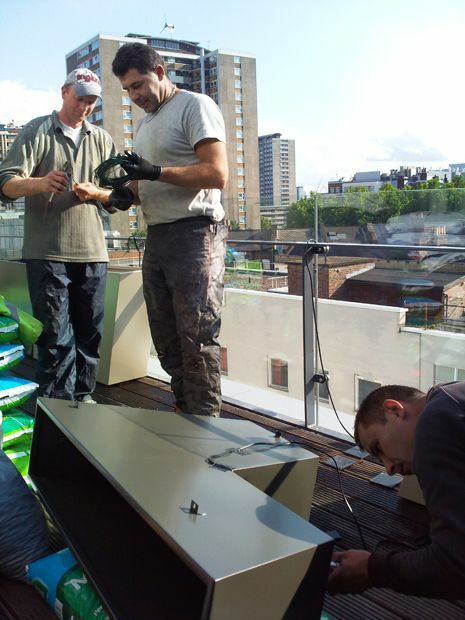 For the clients, this personal process forms an inherent part of the whole design & build package, experienced firsthand, when a distinct build is on a par with an exciting design. 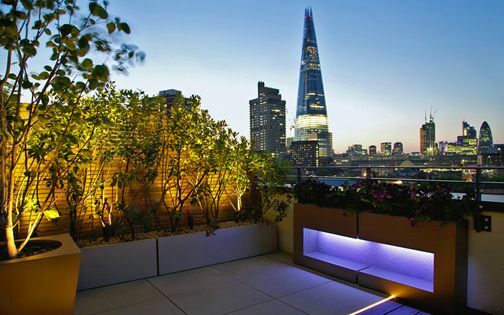 The clients see their renewed site re-emerge from the ground up, and when a concluding tweak of the outdoor lighting system completes a farewell, they settle into a new, liveable garden – built with love, care, expertise and distinguishing originality. We focus for countless hours envisioning the concept for a new landscape scheme, yet no garden design & build project is created merely at the drawing table. 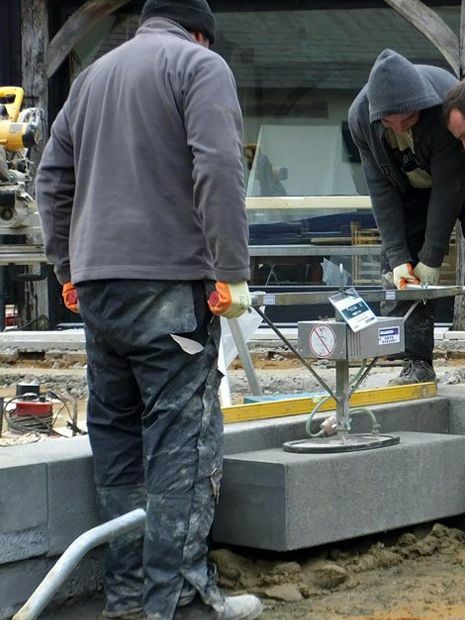 A rewarding outdoor prospect requires supportive clients, inspiring locations and experienced constructors. 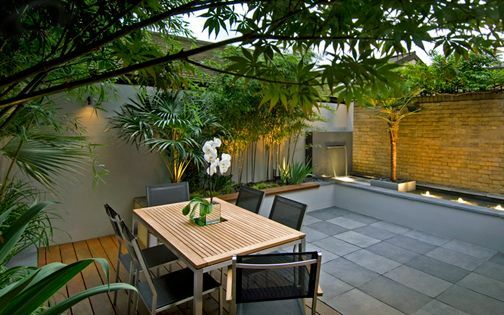 In private residential gardens, this process is all the more vital for a designer. 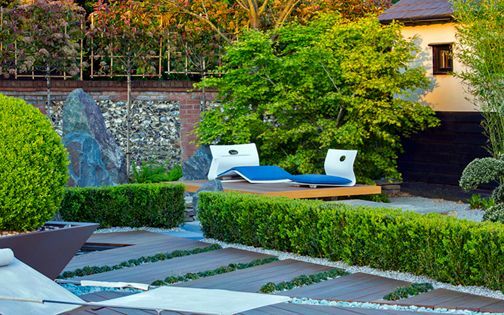 Our one-stop garden design company effectively practises a multidisciplinary methodology, when designing and building bespoke gardens alongside an in-house construction team ensures consistent, cohesive visions across diverse sites, scales and environments. 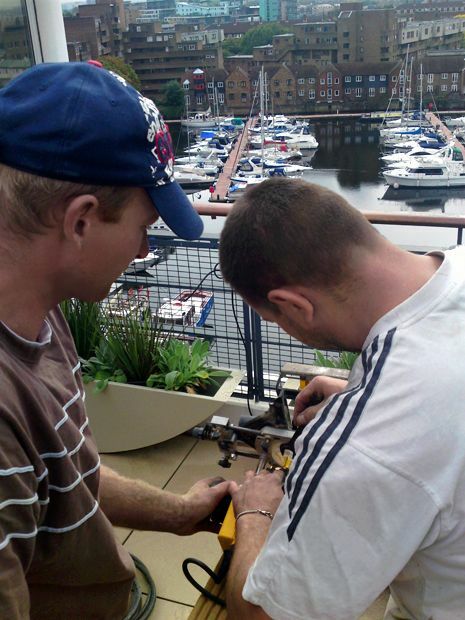 The dizzying heights of St George Wharf required a furniture lift to access the seventh floor of Bridge House by Vauxhall Bridge. During three months, a ritual of setting up barriers, harnessing to a lanyard and breathing deeply formed a daily routine, since only certain plants and tools were transported conventionally via the building's lift. 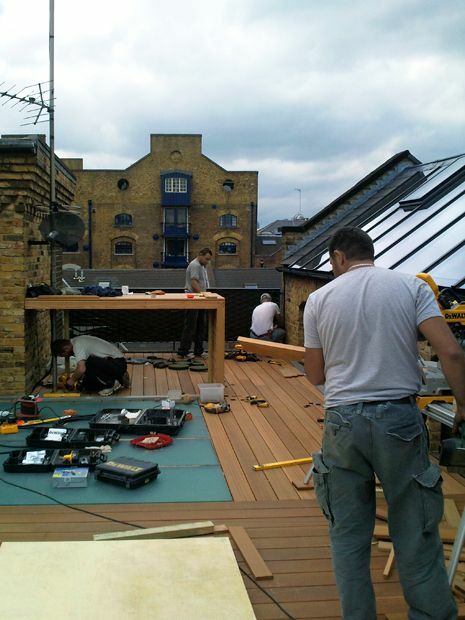 Glass panels were removed on the parapet to enable carrying deck boards, long timber joists, artificial grass and various oversized materials. Enduring a gusty wind and on view from every terrace, this process evolved into a spectacle of epic proportions – though much fun! Along the west boundary of this Debden countryside garden, a sports barn forms a colossal 8-metre elevation. 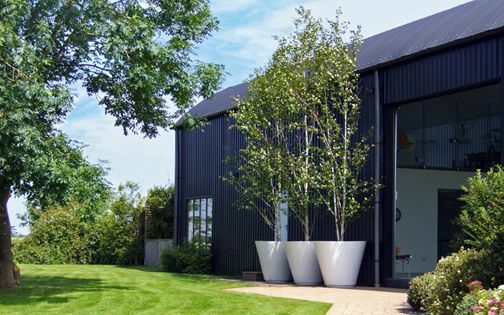 I designed a trio of conical white planters, 1.2 metres in height, to balance the scale, planted with multi stem Silver birch trees to articulate an architectural design. The team was resourceful like always, producing their trickery in a flash, building raised platforms by utilising surplus pallets. 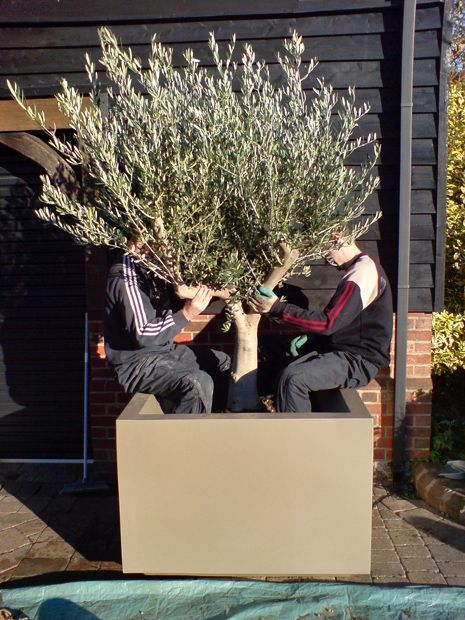 This practical approach enabled lifting the tall trees into the custom-made, powder-coated pots attentively, and before you know it, we had pristine white trunks emerging from shimmering vessels, while savouring a glowing Essex sunset with the added bonus of no plant hire rigmarole. This unique 15,000-square-foot villa, perched above sultry Lake Maggiore near Milan, features sprawling gardens across a steep, 50-metre slope at a 45-degree angle, where the ground is extensively rocky and sandy on top, enabling Mediterranean and subtropical flora to thrive amid torrid humidity. It took nearly three years of visits to Northern Italy before the site was ready for planting, and while no garden & build exists merely as a master plan drawing, its essence is invariably defined by improvisation, ingenuity and backing up with a plan B. 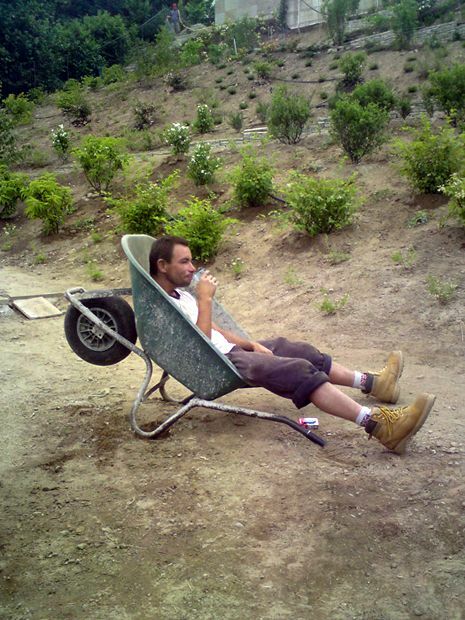 Nowhere else would this mindset manifest itself more than with an Italian crowd; the lovely neighbours allowed us to drive our diggers through their garden to reach the foot of the slope, where many native and fruit trees were being planted. In such a site, no planting plan surpasses the muse derived from the genius loci to articulate inspired soft landscaping. 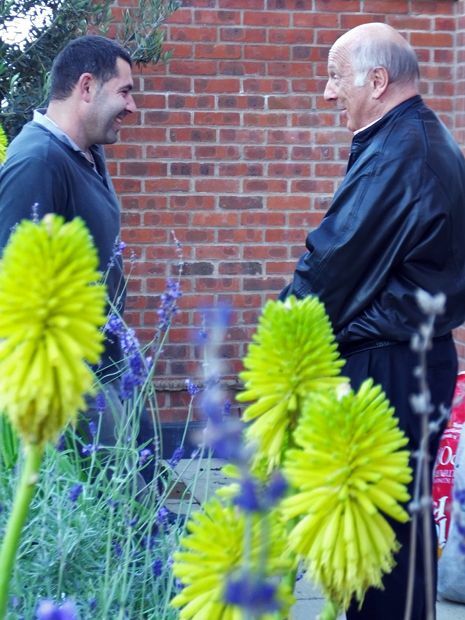 We spent several days selecting 20,000 plants at Como nurseries, yet, setting out in tremendous heat, slowed down by the complex access routine, was effortlessly mitigated by the crew. While developing design ideas in an office is comparatively straightforward, an on-site team which welcomes frequent fine-tuning and logistic constraints with a smile helps produce top projects built with ease. 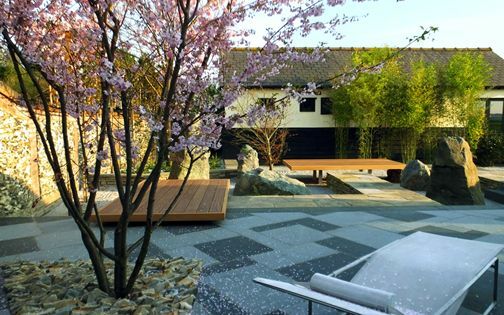 This modern stone landscape formed our third project for these London clients, transforming a corner of their countryside weekend home in Saffron Walden into a Japanese garden. 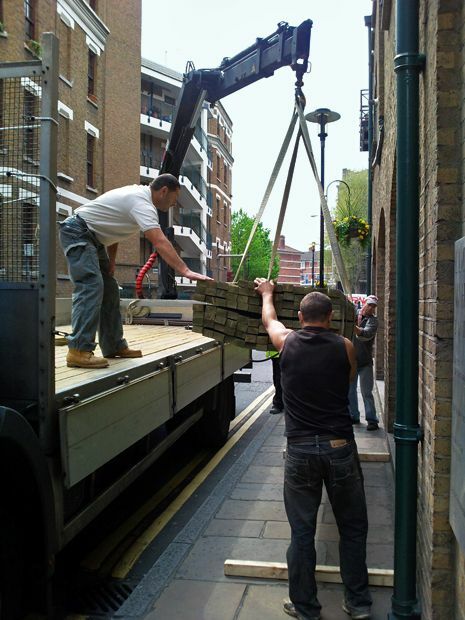 We managed 100 tonnes of materials in and around 220 square metres via the useful back gate. The path leading to the fields is used by farmers driving their tractors, where bringing in artic lorries, cranes and hiabs was no matter for the locals. The crew stayed on site for three months in one of the outbuildings, when this pragmatism improved the construction process, since motorway traffic jams and London hustle were out of the equation. 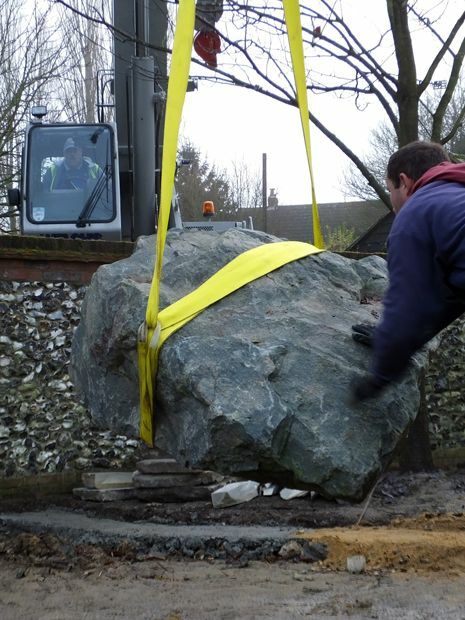 The basalt steps narrating the level change into the sunken garden were far too heavy to carry conventionally, constructed with a hydraulic slab lifter hired locally. The crew loves their gizmos, and this one was a great find – enabling flawless hard landscaping. 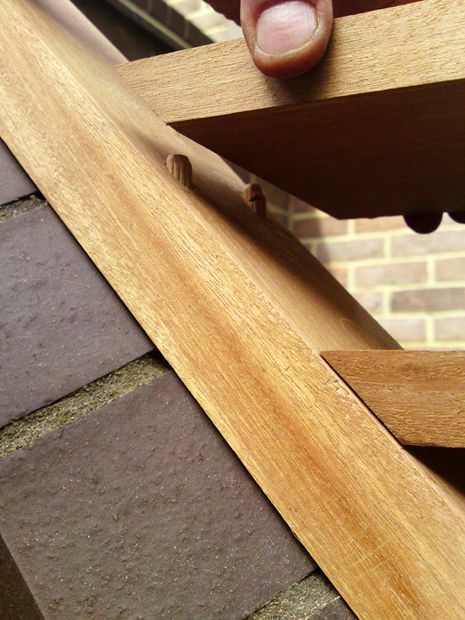 The proximity of local North London projects enables further on-site detailing alongside the team. A local metalsmith, who collaborated on this Primrose Hill patio design project, made our crew chuffed to bits with ad-lib detail and how to effectively adapt and maximise it. The discourse was taking shape when we sought to align a floating bench across three angles between non-parallel walls. 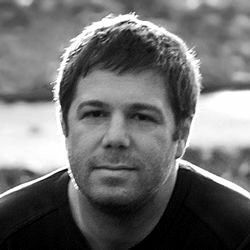 We truly appreciated Adam's addition to the team and his wealth of fresh patio design ideas, if only briefly, while cantilevered on the Hill! The glass and slate water feature for this Highgate home forms a focal point from the kitchen. 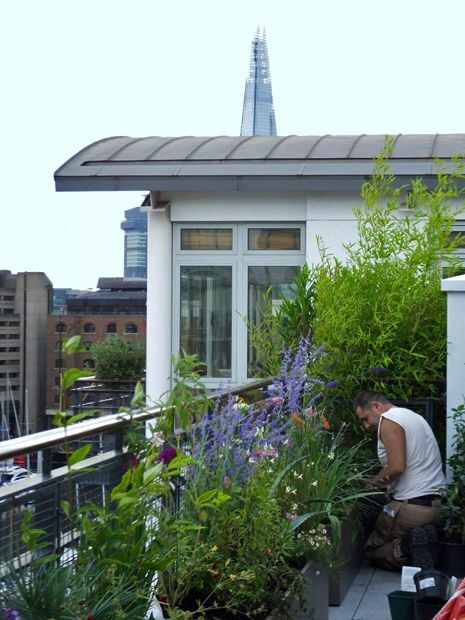 We designed a small roof garden here and revamped the frontage, returning a while later to enhance the back garden. A water feature edifice can be tricky to engineer, and the patience and ingenuity required to fit such apparatus I truly do not possess, yet some of our team members certainly do! The glass was replaced three times, as it hasn't fused sufficiently, while the sheet was heavy to hold and didn't quite fit. 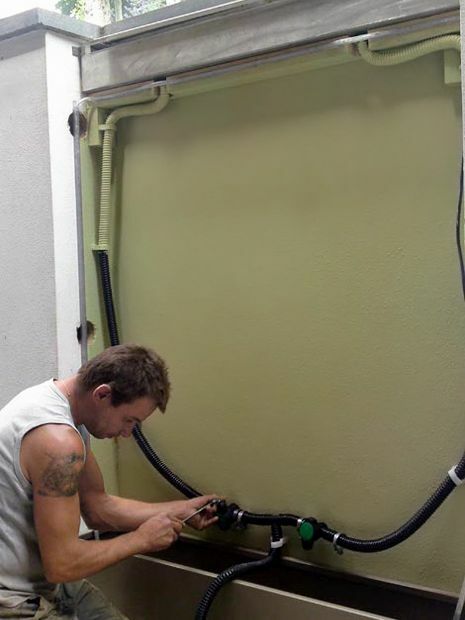 When the energy is all but depleted, a familiar water sound rejuvenates the scene to reveal an ultimate premise – made possible by a guy with indispensable construction savvy and abundant perseverance! 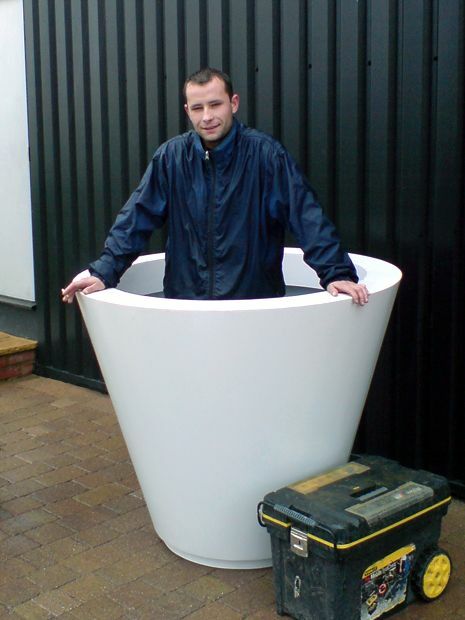 We design large-scale bespoke planters for our clients, tailored for a perfect fit, yet at times, certain sizes present logistic conundrums. We foresee the limitations of installing such vessels, and plan ahead, but sometimes, unique solutions materialise in unexpected places. 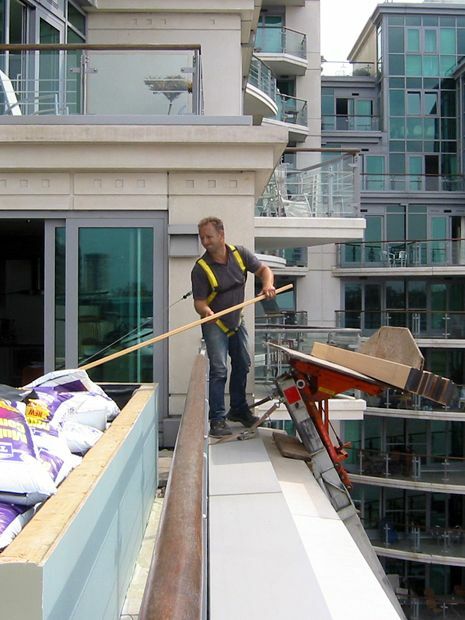 When we developed a Barbican roof terrace for our clients, the colossal tree planters didn't fully fit through the doorway on the 40th floor. Our foreman made an appearance carrying suction pads, a winch and ropes – turns out the glass ceiling insets on the floor above are removable – we made it, eventually! Back in Essex, at the clients' barn country home, there were no access dilemmas, given its spacious private drive, yet, the sizeable Tuscan Olive trees for the frontage required machinery to enable planting up. 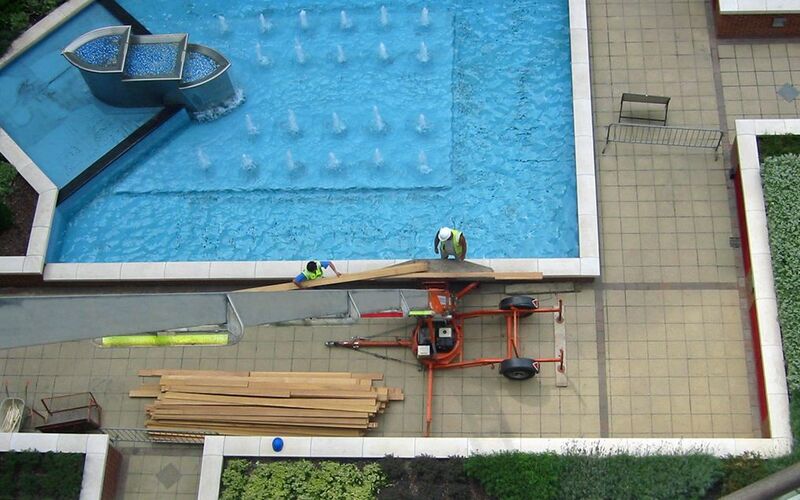 The crew located a forklift, then perched on planter edges to align the Olive tree trunks level and plumb. Driveways are usually uneven, since drainage slopes divert water to gullies, and here, the nifty concealment of pipes, cables and outdoor lighting, behind a flawlessly levelled base, produces pure visual enjoyment less the pipework paraphernalia – the discreet detail of proactive, and capable, landscape construction. The first time I sampled this stone mulch detail in a rooftop garden it seemed too perfectly laid out; describing the concept of emulating a mountain ridge in a pot, with an array of metaphoric paddlestones, is an abstract notion indeed – but we moved on! Once a new detail is established, it often becomes self-explanatory – an intuitive part of a close-knit design and build team. 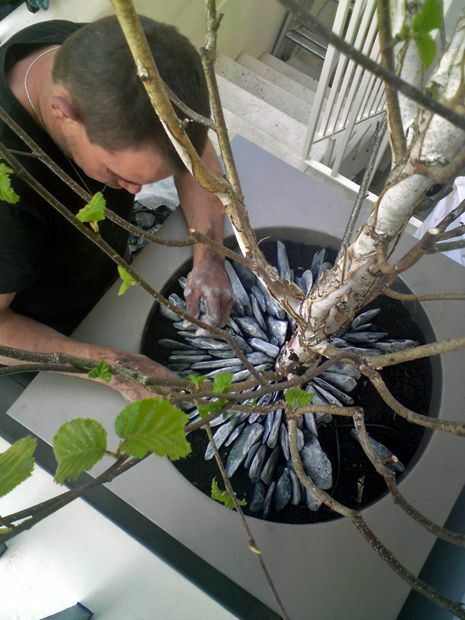 In Belgravia, we returned to revamp the small front garden with bespoke planters, tall trees and modern hedge designs, where a Silver birch tree trunk received a customary concentric slate circle. It's certainly a blissful joy to watch the stone selection process and patience crafted into setting a meticulous yet naturalistic layout – a skill once too rigid, now simply second nature. When folks fall in love with the crew, I can bow out quietly and ruminate, as a kudos barbecue glows into an Alps sunset. 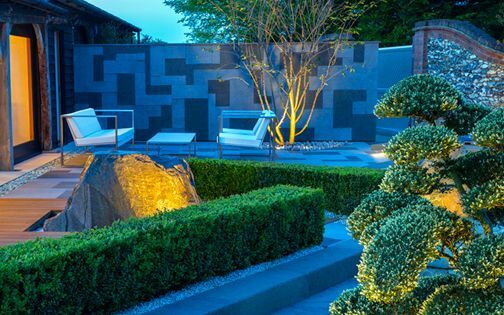 In the heat and humidity of Lake Maggiore, following weeks of planting a tricky rocky slope across two acres of landscape gardens, there was no finer way to celebrate the culmination of a long-term complex project. The renewed lakefront site sustains diverse wildlife, providing essence for our clients, accomplished with the solidity and subtlety of a smooth, considerate landscape design & build process. Many thanks to all the great labourers who shape my designs into liveable outdoor spaces, making my clients infinitely happy, while doing so with sheer discipline and love of their craft. 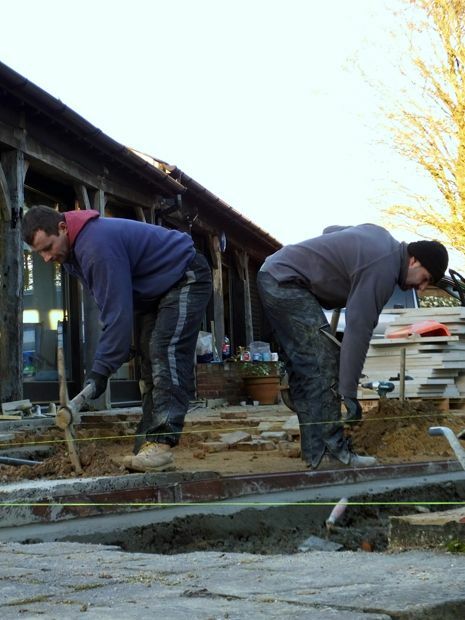 Each and every captivating detail in our garden design portfolio is the result of such admirable dedication, where every team member put their heart into it – through dust, mud, heat, wind, rain and the occasional snow! Who wouldn't want the whole outdoor package – designed, detailed and implemented to perfection, with a low maintenance outlook to boot? We've grown accustomed to life in the superfast lane, where trustworthiness, quality and value ought to be rendered in one click. 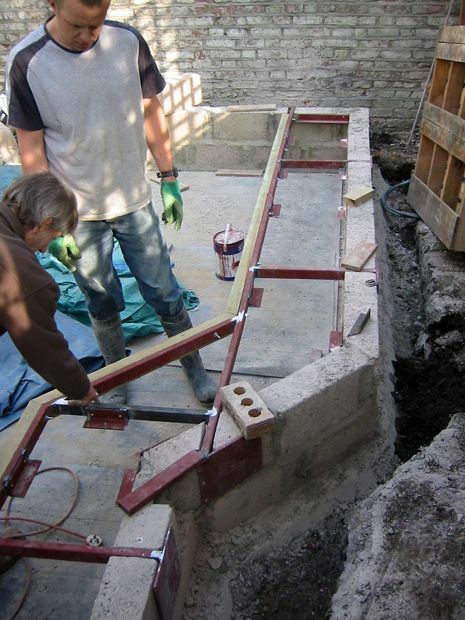 Indeed, we all take for granted an inspiring before & after garden design photograph, but look deeper in its construction details, and you'll see the TLC grafted into it – by a great design & build crew!